MIAMI, USA -- The Inter American Press Association (IAPA) has asked the Inter-American Human Rights Court to rule against the Venezuelan government for the unlawful shutdown of Radio Caracas Televisión (RCTV) broadcasting company in 2007. The request came after Monday’s submission of an amicus curiae brief, which the court is due to hold a hearing on at the end of the month. 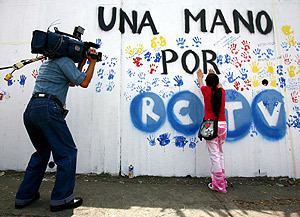 The government, under direct orders from former president, Hugo Chávez Frías, shut down the RCTV’s open signal and confiscated its 48 repeater stations and broadcast equipment. A new public TV channel began operating after the station’s equipment was disconnected. Televisora Venezolana Social (TVes), sponsored principally by the Venezuelan government, is using the frequencies that RCTV previously had and is operating throughout the country using the broadcast equipment belonging to it.